Welcome to iPhone SE, the most powerful 4-inch phone ever. To create it, Apple started with a beloved design, then invented it from the inside out.The A9 is the same advanced chip used in iPhone 6s. The 12-megapixel camera captures incredible photos and 4K videos. And Live Photos brings your images to life. The result is an iPhone that looks small. But lives large. Embedded directly into the A9 chip, the M9 motion coprocessor connects to the accelerometer, compass and gyroscope for a range of ﬁtness-tracking capabilities, such as measuring your steps and distance. It also makes it easy to activate Siri by simply saying "Hey Siri" without having to pick up your iPhone. The Retina display isn't just a place to see your content - it's a flash for your FaceTime HD camera. Powered by a custom display chip that allows the display to flash three times brighter than usual, the Retina Flash helps illuminate your selfies in low light and at night. And a True Tone flash matches the ambient light for more true-to-life colours and natural-looking skin tones. Browse the web, download apps and games, and stream video over 802.11ac Wi-Fi and 4G LTE - with speeds even faster than on iPhone 5s. More LTE bands make iPhone SE better for worldwide roaming.2 And with Bluetooth technology, you can stay connected to your Apple Watch, external speakers and other devices. 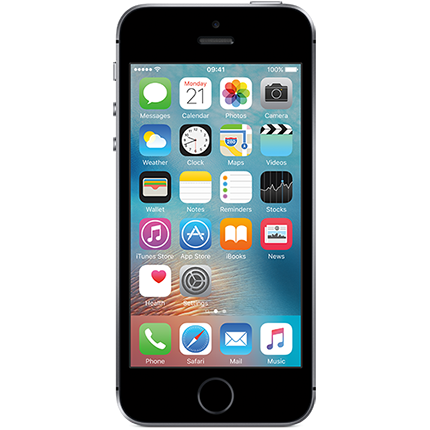 With an easy-to-use interface, amazing features and security at its core, iOS 9 is the foundation of iPhone SE. It's designed to look beautiful and work beautifully on your iPhone, so even the simplest tasks are more fun. Your iPhone comes with a collection of essential apps straight out of the box. Messages lets you send texts with photos, videos, links and more. Music makes it easy to access the entire Apple Music library along with your personal collection.4 With FaceTime you can make video calls from your iPhone to someone else's iPhone, iPad or Mac.5 And Maps keeps you heading in the right direction with spoken turn-by-turn navigation, real-time traffic updates and a helpful Transport view. Siri is your personal assistant, letting you use your voice to send messages, search the web, get guidance on public transport and more. You can even ask Siri to search your photo library to find just the photo or video you're looking for. With over one and a half million apps in the App Store, you'll be able to make your phone your own.6 Whether you browse by category or search for something specific, quickly discover and download new apps with a tap. Data plan required. 4G LTE is available in selected markets and through selected carriers. Speeds are based on theoretical throughput and vary based on site conditions and carrier. For details on 4G LTE support, contact your carrier and see www.apple.com/iphone/LTE.